New South Wales (NSW) is one of the most spectacular courses in Australia and it’s one of the toughest tests of golf in the country. If you have been fortunate (or should we say unfortunate) to try and play NSW in any sort of wind, you will certainly know what we mean. It has lost some of its undergrowth with the bushfires that went through the area a few years ago but the panoramic views that have resulted will leave you spellbound. Initially Dr Alister MacKenzie designed New South Wales in 1928. MacKenzie was responsible for probably the most famed cliff-top ocean course in all of world golf – Cypress Point in the USA – and twelve months later he created the layout here at La Perouse. The NSW course overlooks Botany Bay, where Captain James Cook first sailed in to Australia in 1770. The course was built some 150 years later with the assistance of another famous architect, Eric Apperly, who was largely responsible for the bunkering and ensuring that MacKenzie's vision became a reality. The tough par three 2nd soon gives you a flavour for the stern test of golf ahead. Each of the four par threes are set in different directions, which means that you will be tested by the wind that will hit you from all directions – just like the great links courses in the British Isles. Whilst not a pure links course, NSW's rugged terrain combined with lightning fast greens demand the very best from a golfer both physically and mentally. The stretch of holes from the 5th to the 7th is generally considered to be NSW's best. The par five 5th is a cracker with a blind drive over a hill. If the wind is a northerly, a good drive and a wedge will suffice but if it’s a southerly, you may need up to three woods to reach the green. We then reach the world famous par three 6th with its back tee located on a rocky outcrop overlooking the wreck of the SS Minmi we soon realise that this hole can definitely wreck your scorecard. Sometimes we need to aim our tee-shot directly into the Pacific Ocean for it to move on the wind to reach the green. Such a shot requires the utmost in commitment, just like almost every shot here at NSW, because this course definitely punishes poor or off-line shots more than most other courses. The drive on the long uphill par four 7th is another that requires pin-point accuracy as the vegetation will capture any off-line shot and this green is one of the more treacherous on the course. You will struggle to find a better collection of holes anywhere than the last six at New South Wales Golf Club, beginning with four par fours each of different character. The 13th and 14th are classic cliff-top doglegs and the drive through the 'saddle' on the up-hill 15th, along with the blind second shot, will certainly test your resolve - as will the difficult dogleg 16th. The exposed 17th is another fantastic par three where you miss the green at your peril. The closing par five requires three accurate shots and, hopefully, no more than two nervy putts on a wickedly deceptive green to conclude a truly memorable and exacting round of golf where the clubhouse provides the only respite from the elements. NSW perennially rates in the Top 5 courses in Australia and in the world Top 50. And, whilst it has only hosted a few tournaments in its time, the professionals should consider themselves lucky that they aren't asked to tackle it more often. Some words of wisdom – when you play NSW for the first time, add at least five shots to your handicap before teeing off - you'll certainly have more chance of playing to this higher handicap. Course description by Kevin Pallier. To say I was looking forward to playing NSW would be an understatement. Today was also the day we announced that we had a bun in the oven! The course was in excellent condition, fairways and greens running true. I must also put a shout out to all staff and members at NSWGC, nothing was to much, always helped out and the greens keepers asked me if I wanted my photo taken! Great routing, tough course in general but hey I wasn't complaining! One of the best, NSW, Thank you! It is quite rare even among world top 100 courses, but this golf course has everything : the dramatic scenery with fantastic coast holes (5, 6, 13 and 14 are as good as you can get in that field), links holes, parkland holes, an altogether great lay-out, and the history and tradition that go with a century old club. Sitting in the clubhouse with a beer in hand after your round, you could feel in Portrush or Cruden Bay, and you certainly feel privileged to have lived a memorable day of golf. A truly fantastic experience ! New South Wales Golf Club is so good that even members of the Sandbelt courses give it praise. While discussing various Australian cities and giving compliments to somewhere other than your hometown, I laughed when one of my Melbourne mates said, “it’s just not the done thing, it’s like going to Sydney and admitting that you liked it”. The routing at New South Wales is jaw dropping, and MacKenzie certainly took advantage of the La Perouse coastline. Much has been written regarding the downhill approach shot into the par five 5th hole and with good reason, because it is among the top 20 long holes in golf. Heartbreakingly, I learned that the public walkways between the 5th and 6th holes are forcing the relocation of the world famous par three 6th green, which will move 30 metres away from the position it has occupied for the past 90 years. The greensite is now deemed a health and safety risk to the public. The clubhouse has explanations of the legal situation pinned up on the walls, accompanied by drawings of the proposed new tee box and green locations. This is very sad in my humble opinion, but unfortunately craziness like this is too common in today’s world. Little do the protestors realise what they are doing to one of the most photographed par threes in Australia. During the first week of 2017, I made my second visit to New South Wales GC. Inside the men's locker room was an architects drawing of the proposed changes that would be implemented to the iconic par 3 6th green. 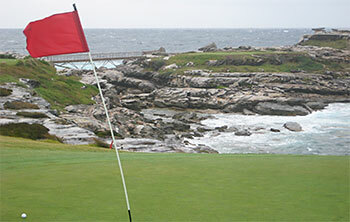 The need for change was driven by the fact that the shoreline there is a National Park and park users were wandering around and getting in the way of golf. The local council insisted on making a public walk path in the safest location possible. Fast forward to now - we learn that Tom Doak is currently contracted to perform the changes and is well on his way to completion. In the end, the green has been moved 10-15 feet closer to the water, which isn't a bad thing. The trick is trying to keep some fairway on the approach since the hole often plays downwind and a ball that lands on the green is hard to stop. New South Wales is a links-style course that has a great routing, plays fast and firm and has a fair number of blind shots. The course has two distinct personalities to it. Holes three through six are characterized by great use of the hilly terrain and dramatic views. The stunning water holes like the fifth and sixth have a feel similar to the Monterey Peninsula and are inspiring. The inland holes on the back nine, particularly the severe doglegs, have a completely different feel and play inland, away from the headlands. My favorite stretch of the course was not the renowned water holes, but the inland stretch from thirteen through sixteen. The interesting combination of heavy vegetation, dunes and blind shots was at times reminiscent of Royal County Down to me. The New South Wales Golf Club is set on a very hilly piece of terrain. Walking the course proved a very good workout. Play begins nears a traditional English-style clubhouse at the top of a hill at the highest point on the property. The routing then goes through the dunes out to the headlands. Beginning on the seventh hole, the course plays back uphill and inland and then returns to the water again for holes thirteen and fourteen before returning inland and uphill once again. This variety of uphill, downhill and back and forth to the water makes the routing very nice. The sixth hole is the famous cross-ocean hole similar to Cypress Point’s sixteenth hole, although I don’t think any hole in the world truly compares to Cypress’s sixteenth. The 500 Toughest Golf Holes in the World ranks the sixth among its holes and I concur. It is 185 meters and uphill from the back tee and all carry. The course is difficult to pin down into one style and to compare to other courses. While playing some of the inland holes on the back nine, which are surrounded by bottle-brush (similar to gorse), the course reminded me a bit of Durban in South Africa and had a real feel of playing through the bush. There are not many courses in the world that can be compared to such a diverse group of courses such as Cypress Point, Durban, Royal County Down and Kawana. The eclectic feel of the various parts of the course really makes New South Wales a microcosm of many of the greatest courses in the world. It was also the most difficult of all the courses I have played in Australia. New South Wales is undeniably a beautiful course with sweeping views across little bay and the ocean it is a perfect picture of golf. That being said almost everytime I have played there has been very little wind to make the course exciting beyond the views. I completely understand why the course is set up as it is as into a gail force wind the course completely changes and becomes a totally different beast. But without the wind it is really not a difficult golf course, thats coming from a 10 handicapper. I'd love to know what lower handicappers think?Bare in mind that I am talking from a low wind perspective the majority of the holes can play very short, example being 5 with a par 5 playing as a driver 8 iron hole. A number of other holes play fairly straightforward if you know the lines you need to take. There are not a lot of elements of risk/reward golf.It sounds like I'm being overly critical of the course and thats probably not fair as I do really enjoy this course, although the walk is the most tiring of any golf course. But I just don't see the golf course as 6 balls when compared to other more interesting layouts. This is an interesting view. I wonder if, say, you played the Old Course on a calm morning you would say the same thing, because the course also needs wind to really challenge, and yet, even without wind, it is a marvelous course. When you rate a links course, it is unfair to denigrate it when there is no wind, as all links courses are designed for wind. I'm a low handicap player and am very impressed you found it relatively easy even without the wind. I have always struggled to play to my handicap there. it's slope rating is one of the highest in the state and the first hole being the easiest on the course ( on the card at least) is a real marker of its challenge. I once bumped into a certain r.ponting, a scratch player himself who said he struggled due to the difficulty there. I played New South Wales GC on a cold and very windy day in January 2016. Playing in a 50 – 60 km/hr southerly “buster” and a temperature of barely 19 degrees certainly presented a new set of challenges compared to the day before when it had been 40 degrees at the Lakes GC. just nearby. The course was in good condition and the couch fairways and bent-grass greens were a pleasure to play on. Any evidence of the overnight dumping of rain had almost disappeared. The layout plays largely through the valleys and occasionally up and over the rises of this magnificently undulating piece of seaside land. Then there are the couple of holes that are exposed to the brutal rocky coast. Not as dramatically high as Old Head in Ireland or Cape Kidnappers “over the ditch” in New Zealand I’ll grant you, but you are much closer to the “action” with sea spray affecting our vision on this very windy day. The par 3, 6th hole of 185m off the championship markers is probably the signature hole. Not because it’s the best or hardest – just because it is the most dramatic. A walk out over a narrow bridge to a tee on a rocky outcrop, from which you hit back over the water to the green gets the adrenaline pumping (especially for me who comes from a course that doesn’t even have a water hazard on it!!) I particularly enjoyed the 14th hole. At only 303m off the members tee it at first appears short. But there’s a trick. It is a slight dog leg left, but has a ridge that diagonally bisects the fairway. The carry over the ridge gets longer the more aggressive your line off the tee. If you are conservative off the tee to ensure you carry the ridge you then have a long second shot for such a short hole. It’s hard to rate the course with the wind so dramatically altering how it would normally play, or how it was designed to be played. The condition, terrain and views certainly warrant 6 balls, and most other commentators suggest the course does too. So I’ll probably go with the majority. Would love to go back to play the course again in conditions that allowed one to appreciate the design, rather than just enduring the elements. One little complaint would be the pace of play. When we caught the field on the second nine (they having had had quite some head-start) we joined up with another single golfer ahead of us. We trudged in slowly with the last six holes taking 1:45hrs to play. This was apparently after the caddy ahead had already made the Proshop aware of the delays. After a couple ordinary holes, the real fun starts at New South Wales. The 3rd is a sharp dogleg with a completely blind drive. Emerging from the chute after hitting one’s tee ball, the golfer is greeted by the spectacular ocean views that (s)he will enjoy for the next 15 holes. After a fine par 4, The 5th, a short par 5, runs down to the shore and precedes the spectacular par 3 6th. Alister Mackenzie’s routing is but one of the strengths here. Local lore has it that he routed the par 3s in four directions, then the par 5s in four directions and then filled in the remaining par 4s. The result is a layout where the golfer gets to deal with the ever-present wind in every conceivable direction. Combined with firm and fast conditions, there is plenty of challenge here, but not so much as to be oppressive to the less skilled golfer. There are plenty of opportunities to challenge the line of charm from the tee, either via doglegs (#s 3, 9, 13, 14. 15 and 16) or on straighter holes with cleverly placed fairway hazards. These hazards are not at all ubiquitous and, when combined with wide fairways, the more common penalty is not a lost ball, but a difficult angle to the green. The bunkering is lovely, but unlike at most of MacKenzie’s other Australian courses, these have the revetted, sod walls characteristic of Scottish bunkers. The greens have plenty of fun undulations and most greens can be approached either through the air or on the ground. The only Australian course I enjoy more than this is Royal Melbourne. I have played Royal Melbourne, Kingston Heath, Metropolitan, Barnbougle Dunes, Victoria and more. I would rate NSW ahead of all of them. I played there in January 2014, for the first time. The course was faultless. It had the conditioning of Metropolitan, the wow factor of Barnbougle Dunes, and the undulation and strategic interest of Royal Melbourne and Kingston Heath. The course starts with an excellent, fair, opening hole, and then just proceeds to get better. Although some in our group were slightly underwhelmed by the 2nd, I thought it was the first of four varied, interesting par threes, all of which run in different directions. Much has been written about the iconc 5th and 6th holes. Whilst deserved, the hyperbole serves to distract from other excellent holes, such as the 7th, which is a demanding uphill par 4, the bunkering of which forces you to make a strategic call as to whether to hit driver off the tee. 13 - 17 is probably the best stretch of finishing holes you could wish to play. Sensational par 4 after sensational par 4 - clifftop views, ocean carries, drives through heathland corners - followed by a fantastic little par 3 and excellent closing par 5. Having thought long and hard, I would rate this the best course I have played, which means above Troon, Prestwick, Royal Portrush, Royal St George's, Sunningdale, and Royal Porthcawl, as well as the Australian courses listed above. Simply outstanding (and, I should add, a considerable improvement on what I consider to be the rather mundane golf offered by some of its Sydney competitors, such as the Australian, Royal Sydney or the Lakes). I had the pleasure of hosting a group of members from Royal Melbourne recently and most of them had similarly kind words and regard for NSW. glad you enjoyed the experience. I absolutely loved this course. Played on a windy day and was kindly accompanied by a gentleman member from the club. I played 15 over my 7 handicap but the experience was worth it. As mentioned in some other reviews no 2 holes are the same and the wind will catch on one hole or another. The view from the 6th tee was spectacular and I particularly liked the 13-14-15-16 string of par 4s. Perhaps the nicest thing about New South Wales is that it is a "golfers" club and can be enjoyed by golfers of all levels. Even though the clubhouse is elegant and the atmosphere great it is not a "social" club in the same sense at, say, Royal Sydney (where I also played) where the extra-golf activities (restaurants, tennis, social facilities) are equally important and are a social destination for upscale families and social groups. My thanks to all of the lovely folk I met at NSW who made my experience so enjoyable. I am pleased you receievd the welcome we strive to provide to all guests. Great course, spectacular setting, good company. what more can you wish from a game of golf anywhere?